I have an addiction to Fudge! 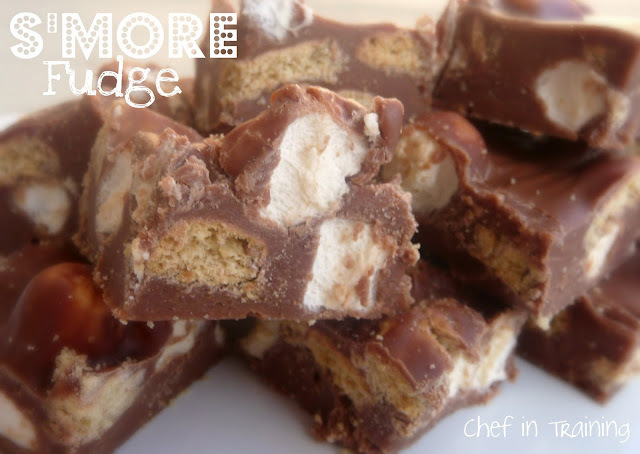 Combine that with my love for anything S’more-related and you get the perfect fudge recipe! This is one more fudge recipe to add to the already amazing list of fudges you have seen! The recipe came from Mandy’s Recipe Box and is so easy to make! If you are still looking for a yummy and easy recipe for a Christmas treat, this is a great one to use! Melt chocolate and milk together over medium-low heat or in a microwavable bowl in the microwave. Once chocolate has melted and heated through, break crackers into small pieces and stir into the chocolate. Next add the marshmallows and stir all together. Spoon into a greased 9×9 dish and spread until evenly distributed. Refrigerate 1 hour. Cut into small squares. Keep extra in the fridge until ready to eat or serve. Anything smores works for me! This looks amazing!! First your rocky road fudge and now this! I made this tonight and it turned out awesome. Thanks!